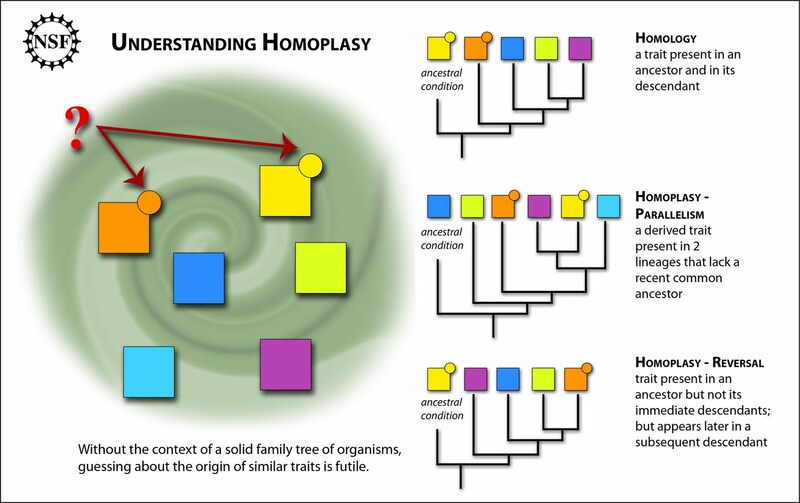 Homoplasy: From Detecting Pattern to Determining Process and Mechanism of Evolution. 2011. D. B. Wake, et al. Science 331: 1032-1035. 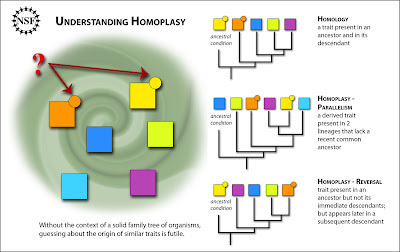 A review paper published this week suggests that studying examples of homoplasy can help scientists analyze the overwhelming deluge of genetic data and information that is currently being generated. For example, studying situations where a derived trait surfaces in two lineages that lack a recent common ancestor, or situations where an ancestral trait was lost but then reappeared many generations later, may help scientists identify the processes and mechanisms of evolution. The authors provide many fascinating examples of homoplasy, including different species of salamanders that independently, through evolution, increased their body-length by increasing the lengths of individual vertebrae. By contrast, most species grow longer by adding vertebrae through evolution. The authors also explain how petals in flowers have evolved on six separate occasions in different plants. A particularly striking example of homoplasy cited by the authors is the evolution of eyes, which evolved many times in different groups of organisms--from invertebrates to mammals--all of which share an identical genetic code for their eyes.